Fazenda Marinha Atlântico Sul is the biggest producer of molluscs in Brazil. It is located in Ribeirão da Ilha, Florianópolis, where the company has a farming area since 1999. The challenge of creating seafood packaging design for Fazenda Marinha was to win over consumers from places without seafood production. To aim that we decided to provide a memorable costumer experience. We produced images of their products in appetizing dishes with a seaside view background. Images that would evoke relaxing experiences of a pleasureable meal by the seaside. To match this ambience we used images of ropes and wooden boards so typically used in Brazilian beaches signposts as support for information. 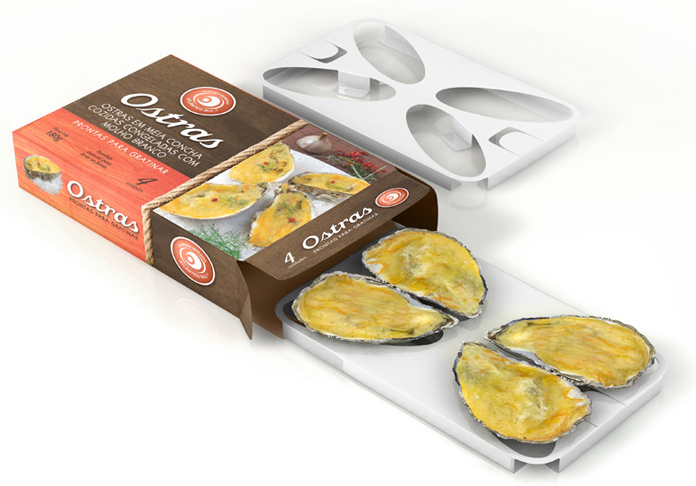 We designed a special tray for the au gratin oysters and mussels that allows products to be taken directly from the freezer to conventional oven or microwave. The purpose is to make oyster preparation more practical thus facilitating consumption. Structural details that add convenience and value for consumers are genuine consumer retention strategies. Apart from the packaging design for seafood we also developed the products catalog and a campaign for points of sale.